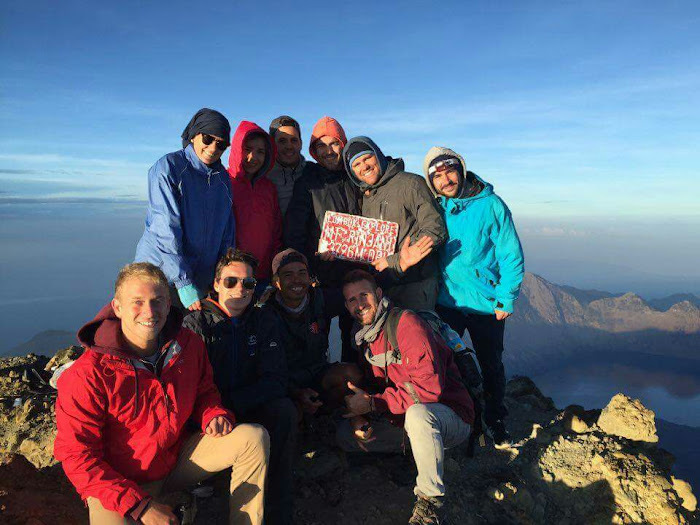 Mount Rinjani Trek 3 days 2 nights, start via Senaru village to Senaru crater rim , lake, hot spring, Sembalun crater rim, summit and trek down to Sembalun village. Registration at the Rinjani Trekking Centre pos 1 Senaru village (601) our trekking tour is begin at 7.30-8.00am in the cool morning ,the first 30 minute we walking are in the open views, and green plant of coffee tree, bamboo, and a many others of the plants belong to the local peoples in Senaru can be seen, we pass walk 30 minute then we reach the gate of the tropical rain forest, short break for 10-15minute then we continue our trek through the jungle where we will shadowing by the sun, walk in the humid temperatures and its will protecting us from the sunshine, a long the way up we will see and found many big trees sound of the animal monkey black/brown monkey can be see and hear ,three hours approximately we walked then we will reach and found pos 2(1.500m) it called pos MONTONG SATAS where we can do break and lay down to recover our energy while waiting for our guide and porters prepare a drinks crackers and fresh fruits, banana, pineapple will be serve here.Its time to go now!, we still in the middle of the tropical rain forest, to get to pos 3 need time approximately 2 hours and during the trips we will find and see the local strawberry is growing long the way up ( June, July, August it season), two hours approximately we pass pos 2 then we arrive at pos3(2.000m) which called MONDOKAN LOKAK where our porter and guide do cook for our lunch here frest fruits and biscuits snack will be serve here ,be ware ! here there many brown monkey live here some time they will stealing your small backpack so make sure don’t leave it a way from you. After 1,5 hours we do rest here then we will continue to CRATER RIM (2.641m) first 25 minute we pass the Mondokan Lokak then out from the tropical rainforest so we walk on the Savana on the hills with open views then the trail quite steep but the beautiful scenery of the 40% over Senaru village taking break we called CEMARA LIMA and then we go further to Pelawangan 1 Senaru Crater Rim (2.641m) for about one hour to get there camping and over night with own dinner here, the trail are stony and quit steep up, and you will find great moment of your life from Senaru Rim views:- Spectacular sunset over the 3 Glis and mountain Agung in Bali- Sun rise from next to the valley of mt. Sanggka Reyang- Smoke that throughout hole of New volcano in the middle of Lake segara Anak- Peak of Rinjani mountain 3.726m- Best sleep under the stars. After breakfast and enjoying the sunrise, we will go down to Segara Anak lake 2008 m, walking time approximately 2 hours, this route is quite steep down and slippery, then you have tobe careful don’t try to go head and far please wait instruction from your trekking guide and stay close with him or the porters, ask help to hold your hand just incase and make sure that your step on the right way, a long they way down the beautiful scenery in front of you more down and more exciting to taken the picture of the baby of the volcano as if just front of, finally after 2 hours down from the crater Rim, then you will arrive at the lake the place where you can do full relaxing, hot spring just next 10 minute walk from the lake, where you can soak in healing your skin as medicine and natural hot spa,have lunch by the lake and resting, then in afternoon we go up to crater Rim where we can set up the tent for our second nights have great sunset from this point including your lovely dinner. We will wake up at 02:30 am and usual time but, it the way for not missing the sun rise, and have a light breakfast. At 03:00 am start the trek for heading to the Rinjani summit (3672 m). Walking time about 3 hrs and 30 minutes. The 1st stage is a moderate climb for 2 hours, while the 2nd stage is a fairly easy but long trek. The last hour is very steep and difficult (there are many loose stones, and as you take two steps forward, you will slip one step back).From the Summit of Mount Rinjani, you can see all of Lombok island, Bali, Mountain Tambora in Sumbawa and Segara Anak lake. After sunrise we will go down to the Sembalun crater rim and have breakfast. After breakfast and a rest, we will continue to go down to Sembalun village, walking time 4-5 hours, have some lunch on the pos 3 or 2 and will arrive in Sembalun village(1.150m) at noon time ,our car waiting here for bring us to Senaru village take your luggage and transfers to your next destination (Gilis,Senggigi or Mataram) end of service. Copyright © , Rinjani Climber. All Rights Reserved. ﻿ created and designed by redBlack.